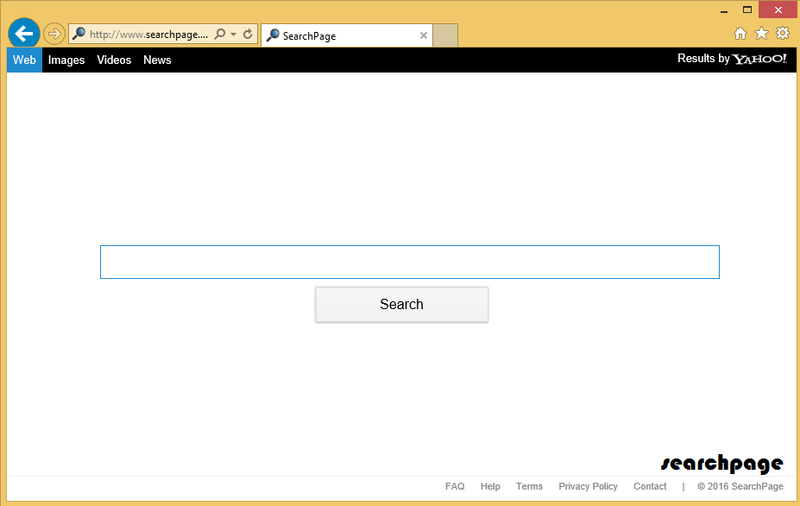 Mysearchpage.com also known as Searchpage.com, is classified as an intrusive browser hijacker. After it infiltrates your system with the help of free software, it alters your browser preferences. The hijacker is compatible with all well-known browsers, so it does not matter which one of them you use. The main purpose of the unwanted program is to flood you with as many advertisements as possible. The reason for that is simple: every time you click on one of the ads, the developers of the hijacker earn revenue. Unfortunately, you will not benefit from it in any way. In fact, the hijacker will slow down your online surfing and expose you to unreliable content. We suggest that you waste no time and terminate Mysearchpage.com right away. The main symptom of Mysearchpage.com is that this page replaces your home page and default search provider. The website does not appear suspicious at first. It has a search box with search parameters at the top of the page. It also has links to FAQ, Help, Terms, and so on. If you click on the FAQ link, you will be presented with a description stating that Searchpage.com is a global Internet company that presents worldwide users with search solutions. It is supposed to provide you with easy access to information from the Web. The description may be rather vague, but after reading it, one can assume that the so-called search engine will actually show original results. That is not the case. All it does is bring you search results powered by Visicom Yahoo Search. You should keep in mind that these results will contain sponsored links. We advise that you be careful with all commercial data that is related to the hijacker, because it may be unsafe. It is clear that the hijacker will not improve your search experience. In addition to that, it will also disrupt your browsing by flooding you with ads, causing redirects, slowing down your Internet connection speed, and more. If you wish to go back to uninterrupted online surfing, you should delete Mysearchpage.com as soon as possible. In order to eliminate Mysearchpage.com from your browsers, you will have to choose between one of the two following options: manual or automatic removal. If you decide to erase Mysearchpage.com manually, you will have to delete the program that entered your PC together with the hijacker. It may be SearchPage Tab or some other potentially unwanted application. Once you uninstall it, you should be able to remove Mysearchpage.com from your browsers without any difficulty. You are welcome to use the instructions we have prepared below the article for further assistance. Alternative way to get rid of Mysearchpage.com is to implement a malware removal tool from our page. It will not only clean your system, but also keep it protected from similar and more harmful online threats.